The determinations of the CMB temperature and polarization across the sky act as powerful constraints of the cosmological parameters. To achieve accurate cosmology measurements, a robust likelihood function must be developed that considers a variety of factors: the correlation of the temperature and polarization fields, the correlation of angular power spectrum estimators at different multipoles (&ell;) due to partial sky coverage, unresolved astrophysical foregrounds, and instrumental factors. The likelihood function is key as it can serve as the prime CMB analysis tool. CAMEL uses a variety of low-&ell; and high-&ell; likelihood functions. These functions are presented below. The Planck Legacy Archive (PLA) gather all the information associated with the released Planck likelihood function. 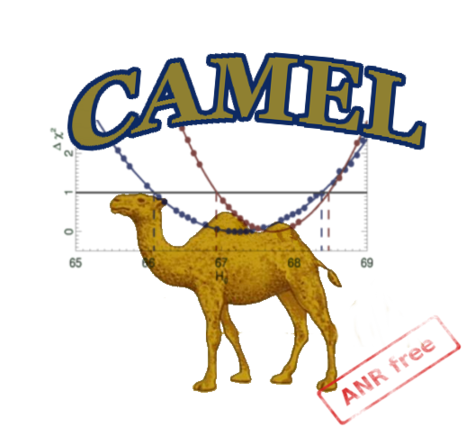 CAMEL is fully compatible with the Planck likelihood format (clik). The Hillipop likelihood function is one of the three Planck high-&ell; (&ell;>50) likelihoods (see Planck 2015 results. XI.). It has been developed within the Planck collaboration at Laboratoire de l'Accélérateur Linéaire (LAL). It is based on a Gaussian approximation to compare the temperature and polarization cross-power spectra estimated &ell;-by-&ell; with models in the range &ell; = [50,2500]. The data consist of two sets of half-mission (I,Q,U Stokes parameters) maps at 100, 143 and 217 GHz. Frequency dependent apodized masks are applied to these maps in order to limit contamination from emission of diffuse Galactic dust, Galactic CO lines, nearby galaxies and extragalactic point sources. We ultimately retain 72, 62 and 48% of the sky at 100, 143 and 217 GHz, respectively. The same set of masks are used in temperature and polarization. Mask-deconvolved and beam-corrected cross-half-mission angular power spectra (first order a&ell;m correlation) are computed using Xpol (a polarized version of the Xspect code Tristram+ 2005, MNRAS 358 833). From the six above maps, three sets of six band-averaged angular cross-power spectra are derived for TT, EE and TE. We select the multipole ranges to limit contamination from diffuse Galactic dust emission at low-&ell; and noise at high-&ell; in each power spectrum. We derive a likelihood for each data information (hlpT, hlpE, and hlpX) and combining all (hlpTXE). Note that we provide only hlpT and hlpTXE for now (the polarization data will be included in the near future). As the angular power spectra are highly correlated, we developed a semi-analytical estimation of the covariance matrix, which encompassed the anticipated (&ell;-by-&ell;) correlations. The method employs data estimates only, with no reliance upon Monte-Carlo simulations. We worked intensively to achieve an accurate calculation of the 4-a&ell;m correlations. We tested the approximations used in the calculation with Monte-Carlo simulations and we found that a precision better than a few percents was achieved. In addition to the CMB component, our model considers foreground residuals and calibration differences among maps. We use different models for the foreground’s angular power spectra in temperature and polarization. Our model includes contributions from CIB, Galactic dust, thermal and kinetic SZ effects, Poisson point sources, and cross-correlation between infrared galaxies and the temperature SZ effect. For model construction, we employed the Planck measurements of the millimeter sky (the 9 frequency band data from Planck permits a highly-accurate estimate of the angular power spectra and SED of the different astrophysical emission). The Hillipop temperature likelihood function encloses 6+ cosmological parameters (6 from the base ΛCDM + eventual extensions), 6 parameters associated to calibration (1 absolute calibration and 5 calibrations at the map level relative to 143 GHz first half mission map) and 9 parameters corresponding to the amplitude of the angular power spectra of the astrophysical foregrounds considered in temperature (radio point-sources, IR point-sources, tSZ, kSZ, CIB, Galactic dust and CIBxtSZ). There is a maximum of 21+ free parameters in the Hillipop full likelihood function (19+ for hlpT). The high angular resolution CMB data sets (or VHL for very-high-&ell; likelihoods) include measurements from the ground-based Atacama Cosmology Telescope (ACT) and South Pole Telescope (SPT). As explained in Planck 2015 results. XI, the high-&ell; likelihoods includes ACT power spectra at 148 and 218GHz [ Das et al. 2014, JCAP 4 14 ], with a revised binning (described in Calabrese et al. 2013, PRD 87 103012) and final beam estimates [ Hasselfield et al. 2013, ApJS, 209, 17 ], together with SPT measurements in the range 2000<&ell;<13,000 from the 2540deg2 SPT-SZ survey at 95, 150, and 220 GHz [ George et al. 2015, ApJ 799 177 ]. ACT includes two different datasets from two different surveys: ACT_equat and ACT_south, corresponding to their two observed areas. To assess the consistency between these data sets and Planck, we use the same templates for cosmic infrared background (CIB) fluctuations, the thermal SZ (tSZ) effect, kSZ effect, and CIBxtSZ components. As the choice for templates are different in Hillipop and plik (PLA likelihood), and as these templates have different formats in each case, we have two version of the parameter files ; those for plik are named '*_plik'. Additional nuisance parameters for ACT and SPT are described below. SPT likelihoods are coded for each survey corresponding to Story et al. 2012 (SPT_low), Reichard et al. 2012 (SPT_high) and George et al. 2014 (SPT_high_2014). Dust amplitude: SPT_ADust. This is generally kept fixed, as in the SPT analyses. SPT_low spectrum the wanted ell range (there are 47 bins from 650 to 3000). removing the 150 GHz channel from the SPT_high likelihood. this can be done by adding to (e.g.) SPT_high.lik : remove_150 = 1 (other frequencies can also be removed). In both cases, the required data are selected and its inverted covariance matrix is recomputed after eliminating the necessary rows and columns. BAO information is added using several C++ classes, implementing simple (1D) χ2 built from the Dv/rs measurements for the various projects (using a Gaussian constraint) or a bit more elaborate 2D constraint (also Gaussian) in the (H(z),DA(z)) plane. No additional nuisance parameters are needed to handle these. Constraints on Dv/rs (at one or several redshifts) are managed by a single parameter file compiling all measurements. You can activate or remove data line-by-line or with in/fix parameter. BAO_LyaDR9_busca.lik : DR9 Lyα from Busca et al. Our baseline uses Anderson et al. 2011. The results from Lyα are a bit outdated (and not in perfect agreement with each other). Other similar measurements at other redshifts can be added in your par file. DR12 results from BOSS consist in simultaneous constraints on (DM(z), H(z), f.σ8(z)) for 3 redshift bins. This is implemented in the BAO3D class as correlated Gaussians, using the covariance matrix given in [Alam et al., 2016] (arXiv:1607.03155). Note the two mandatory class parameters, needed to compute 'sigma_8' (do_mPk to compute the matter P'_k's') at redshifts lower than z_max_pk. WARNING: this dataset supersedes both the BOSS DR11 2D results and the BOSS DR11 LOWZ result (should be disabled "fix" in the BAO1D lik file) ! ΔM, the SNIa max. magnitude, Mabs, is described as having 2 distinct values (differing by ΔM) in 2 host mass intervals (see fig 12 of the paper).